This is the time of year when the Vancouver Symphony Orchestra presents a goodly number of “specials” concerts, events designed to bring in less traditional audiences. From the songs of ABBA to the themes from video games, these offerings will help atypical symphony audiences gain entertaining and valuable exposure to musical expressions that might otherwise remain inaccessible. It’s smart marketing, good public relations, educational, provides work for our excellent local musicians, and, perhaps most importantly, helps the VSO’s bottom line. It also helps break down the perceived snobbery barrier—real or not—that shields most symphonic presentations. 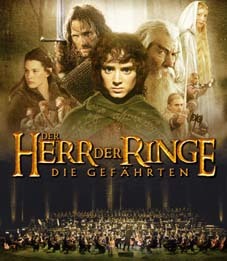 This past weekend (November 27 and 28) saw performances of Howard Shore’s Lord of the Rings Symphony. Your agent attended, as the guest of a 10-year-old boy, and was interested—as one half of a confirmed LOTR nerd pairing—in observing the makeup and behaviour of the crowd as compared to your run-of-the-mill symphony attendees. There were definitely fewer people sporting formal or semiformal wear, but no dress-up hobbits, orcs, or sword-wielding heroes were to be seen. There was a much higher percentage of younger faces overall, and more than a few young boys—perhaps the wizard-loving offspring of VSO season subscribers—crammed uncomfortably into dark-coloured suits with ties. Those expecting boorish or nerdish behaviour in the lineup outside the sold-out Orpheum had to content themselves with the unholy spectacle of two couples chugging canned power drinks before surrendering their tickets, perhaps to enhance their jittery pre-performance apprehension. During the execution of Shore’s masterwork—six movements performed by orchestra, chorus, and soloists—the Tolkien devotees and movie fans seemed positively, well, spellbound. Regular concertgoers might be advised to learn something from their behaviour: no ringtones, almost zero throat-clearing and coughing, chatter held to a minimum, and no crinkling of candy wrappers. The performance itself was glorious, with a full orchestra and at least 100 voices from the Vancouver Bach Choir and its children's chorus regaling ears with the surprisingly emotion-tugging composition distilled and assembled from Shore’s 12-hour score for the Lord of the Rings film trilogy. The symphony’s periodic familiar and reedy Celtic tin-whistle melody, gently and wistfully emblematic of the Shire, seemed to captivate listeners more than any other reprised sections, and its soloist was singled out for special attention. The dissonant percussion of the orc armies, the noble strains exhorting the riders of Rohan, and the reflective, pitiable expression of Gollum’s lament flowed seamlessly with the visual counterpoint of projected artworks depicting characters and scenes from Tolkien’s tomes. Audience inexperience reared its head with some untimely clapping and the ultra-enthusiastic ovation prior to the intermission—clearly, more than a few were under the impression that the concert had ended after only two movements and some of the more familiar airs from the screen soundtrack. Overall, though, it would be hard to imagine a more thoughtful and enraptured audience. So what if the coda was preempted by vigorous, if misplaced, applause? It was in spontaneous response to soloist Kaitlyn Lusk’s splendid rendering of “Into the West” and was taken up be a few hundred pairs of hands before petering out as conductor Markus Huber soldiered on. The actual finale was followed by extended, appreciative applause, nothing mechanical, and with few of Vancouver’s usual “let’s get ’em off their feet” standing-o disciples. A better line couldn’t have been written for TV’s Crane brothers, Frasier and Niles. But take heart, Lord of the Rings geeks. She was definitely in the minority that night. And we were two inexperienced nerds who had a simply wonderful evening. AintItCool's Holiday Gift Guide has, for years now, provided the ultimate shopping list for those searching both on and off the beaten path for the intersection of pop culture curios and art world opuses. Thus I could not be more pleased that -- amidst Roald Dahl, Marylin Monroe, Michael Cain, Brian Sibley, and a lovely edition of The Hobbit -- The Music of the Lord of the Rings Films has made this year's list! As before, it's likely nothing new to us. But it's always a welcome statement, nonetheless. Read the full piece here. While we in the states are battening down for the Thanksgiving holiday and its epicurean demands, Vancouver is gearing up for this weekend's performance Howard Shore's The Lord of the Rings Symphony. Today, the Vancouver Sun is running an interesting article on the upcoming performance. I'm not sure I agree with each and every point, but the writer makes some intriguing observations. See what you think. VANCOUVER -- It’s often unexpectedly interesting to consider musical “first contacts”: the pieces we hear that draw us into the world of music. For classical fans these magical portals are typically encountered in music lessons and school concerts or on music-related field trips. Recently I worked with a batch of young composers in Victoria. Titles that instantly evoked the ubiquitous world of video games forcefully reminded me that many of my budding composers were recreating sounds heard at home on their Xboxes, PlayStations, and TV screens. This new reality is very much behind two events at the Vancouver Symphony over the next few days. This weekend sees two performances of Howard Shore’s The Lord of the Rings Symphony: Six Movements for Orchestra and Chorus; on Dec. 6 it’s Play! A Video Game Symphony, featuring a potpourri of music composed for popular games from Super Mario Brothers and Sonic the Hedgehog to the premiere of Civilization V.
Doubtless, the odd ultra-traditionalist out there will grump that this a misuse of the power and prestige of the symphony orchestra, but I don’t see it that way and neither does the VSO. In the early days of cinema, filmmakers learned important lessons from opera, ballet, and oratorio. Now, a century later, (and with “classical” music a harder sell than it once was), it’s payback time. The world of popular entertainment finds itself re-popularizing the classical world. Film music for today’s big epics is inordinately listenable. 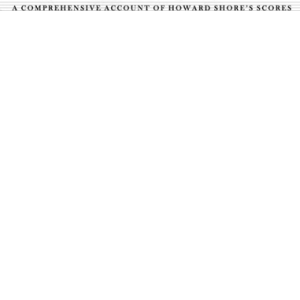 Howard Shore’s scores for the three J.R.R. Tolkien movies amount to hours of powerful music. In context it’s instantly obvious how his musical leitmotifs and styles relate to the unfolding plot. Jettison the visuals and you have a challenge; translating such material for concert use is an art in itself. What someone who has never read the books or seen the films might make of the concert, assuming you could find such an individual above the age of five, is a moot question. Shore adapted his materials with conductor John Mauceri, “Moulding them into a series of tone poems free of the specific visual linkage with the films.” “Symphony” is something of a marketing misnomer for the resulting concert version, which is described as “in the traditions of the programmatic orchestral works of Strauss, Liszt, Smetana, and Sibelius.” Projected images come not from the film trilogy (presumably for copyright reasons) but from visual interpretations of Tolkien by artists Alan Lee and John Howe, which mostly predate the movie adaptations. Then there’s the issue of scope and style. Within the three interconnected sagas, Shore references a grab bag of styles from simple folk-flavoured tunes and hymns up to grand symphonic set pieces. 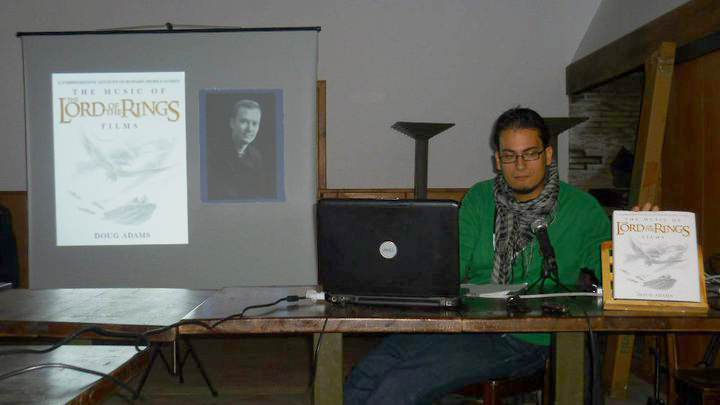 Shore’s basic challenge was the same Tolkien faced in writing his trilogy: keeping a certain opera composer well out of the tale of a magic ring that threatens the universe. There are no Wagnerian gods onstage in this trilogy, and traditional hero-worship is unequivocally rejected. The Siegfried equivalent, Boromir, is corrupted and killed off at the end of Part 1, and the comically bourgeois and diminutive hobbits emerge as the true, albeit reluctant, saviours of civilization as Middle Earth knows it. Shore’s most subtle effect is a sustained irony: The rousing theme that accompanies the nine multi-species members of the Fellowship of the Ring is undercut by our knowledge that their desperate quest is not to find a treasure but to destroy one; the ethereal music of the High Elves sounds faintly discordant; and the most gorgeous theme of all is that of the seductive, quintessentially evil Ring itself. For non-traditional listeners more in tune with technology than Tolkien, Play! A Video Games Symphony may be more the ticket to the thrill of orchestral music, live. Unlike Shore’s Tolkien symphony, the Video experience promises to be different: hands-on (literally) game play is less about consistent narrative and more about bursts of action. Nor is there a single compositional voice to the video games live event; rather, there’ll be snippets from more than a half dozen games — definitely not a “symphony” in the traditional sense, but an orchestra workout nonetheless. No matter: it’s a brave new world of music out there and there are big audiences with keen interests. How prescient of the VSO to provide entertainment now while sowing the seeds for an continuing love affair with orchestral music in the future. The Lord of the Rings obsessives will revel in Doug Adams' immersion in the making of Howard Shore's score to the screen trilogy. The Music of the Lord of the Rings Films is an exhaustive exploration that includes many musical examples, a rarities CD and lavish illustrations. One again, it's incredibly gratifying to see the book, and Howard Shore's music, in such illustrious company. Other recommendations range from Sondheim to Cage, and Barber to Mahler. Even the latest from the great Alex Ross sits nearby ... I still need to pick that up! The Munich Symphony, under the direction of Ludwig Wicki, will take up the mantle this spring, and perform the world's second Lord of the Rings Cycle, featuring live-to-projection performances of all three of Howard Shore's scores. Details and tickets are available here. Mark your calendars for April 17 and 19 (FOTR), April 20 and 21 (TTT), and April 24 and 25 (ROTK). Middle Earth has been good to Canadian-born composer Howard Shore, who sees his Oscar-winning score for the Lord of the Rings movie trilogy as his crowning achievement. "The piece is very close to me, I spent close to four years writing it," says Shore. His Rings symphony has gone on to a life on the concert stage, the latest stage being next week's performance by the Vancouver Symphony Orchestra. 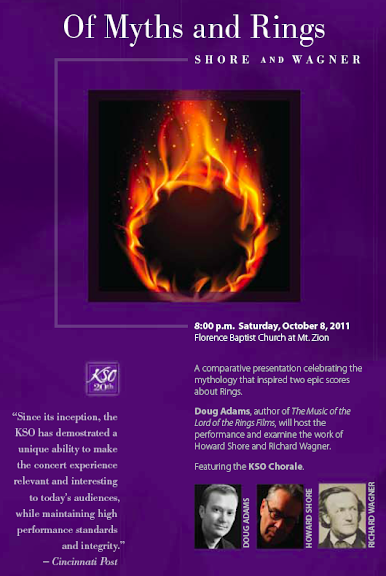 The performance, conducted by Markus Huber, and featuring soprano Kaitlyn Lusk, will also include the Vancouver Bach Choir, the Vancouver Bach Children's Chorus, and images by Tolkien artists projected on video screens in the hall. 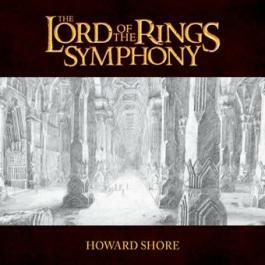 The two-hour, 10-minute symphony takes the listener through the entire Lord of the Rings story, although Shore wrote a total of nearly 11 hours of music for the three movies based on J.R.R. 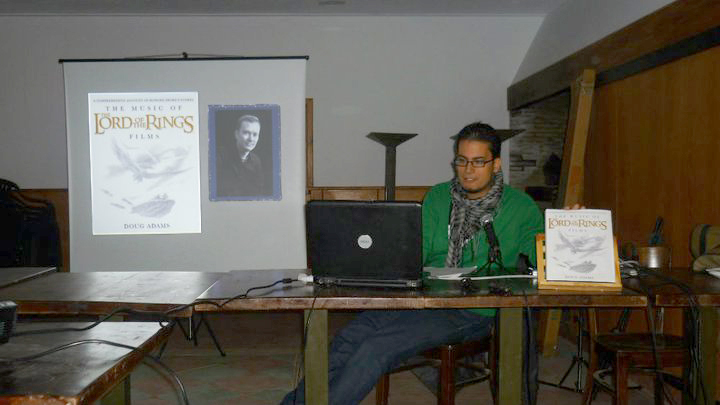 Tolkien's fantasy novels. "Really, everything I knew about composing, orchestrating, conducting -- everything I had learned about music was in it," says Shore over the phone from his New York office. Those of you who follow my Twitter feed have probably noticed a few messages today regarding the obscenely tragic death of publicist Ronni Chasen. During my grad school years Ronni hired me to write official composer bios for her firm. At the same time she boosted my budding music journalism career by arranging high-profile composer interviews ... including my very first chat with Howard Shore. She was tough, but wonderfully supportive. She was even one of the very first to read the Music of LOTR book, and offered me her very meaningful encouragement. She was someone I worked with on a semi-regular basis, and in fact, we were due to speak later this week. Ronni rubbed elbows with the true showbiz elite, but she still made time for small-potato writers like me. She called in person, answered her own emails, and made you feel like you were part of something that mattered. She was a wonderfully eccentric character -- a real throwback to the moxie and genuineness of Hollywood of old. I have quite the catalogue of Ronni anecdotes, as did almost anyone who worked with her, but somehow I'm not much in a regaling mood tonight. Ah, it does my heart good to post this. We finally have our first-ever Midwestern book event scheduled ... and in the Chicago area no less! On Wednesday, December 15 at 7:00 p.m. I'll be speaking and signing copies of The Music of the Lord of the Rings Films at the Borders Books in Lincoln Park, Illinois. Perfect timing for holiday shopping! Help spread the word on this, if you would. I'm very excited to have an event so close to home, and hope to see many of you there! Additional details as the event nears. Olivier Soude at UnderScores Magazine has been busily preparing this wonderful in-depth interview for several weeks now, and has done a tremendous job. 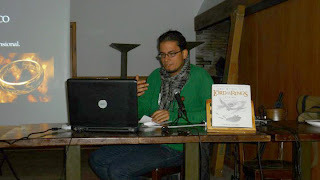 I'm proud to present his final article -- via the links below -- in both English and French. And of course, I'd be remiss if I didn't mention once again that the book's French distribution woes are now at an end, so if you're on that part of the globe, feel free to stop by Amazon France at your leisure! One book to discover them all. One of the biggest cinematographic hits of the beginning of the 21st century, The Lord Of The Rings films gave to Canadian composer Howard Shore the opportunity to compose the work of a lifetime, a piece that will probably stay forever as his best. When he was officially announced as the composer of the trilogy, there were many reactions, but only a few to defend this choice. Nevertheless, with the Peter Jackson films, Shore fulfilled his duty beyond our greatest hopes. As the three volumes of The Lord Of The Rings were conceived by Tolkien as a whole, the three scores have been thought as one, patiently built by Shore from The Fellowship Of The Ring to The Two Towers and finally The Return Of The King. 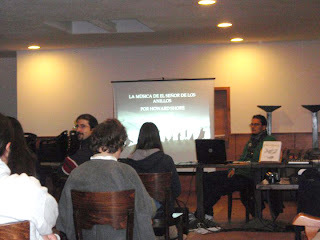 Doug Adams, the American musicologist author of The Music Of The Lord Of The Rings Films, was able to go deep inside the musical odyssey of Howard Shore as the composer invited Adams in 2001 to follow him into Middle-Earth. The Music Of The Lord Of The Rings Films take us inside the numerous musical themes and motifs, dealing about their use into the three movies, introducing choir and songs texts, reporting about the scoring sessions, the special instruments used within the scores… Rich and sharp, beautifully presented, The Music Of The Lord Of The Rings Films proves that beyond the own beauty of the music, Shore’s work is distinguished by its profoundness and intelligence, as much as Tolkien’s work is. Un livre pour les découvrir tous. Immense succès cinématographique du début de ce XXIème siècle, l’adaptation de The Lord Of The Rings (Le Seigneur des Anneaux) a donné l’occasion au compositeur canadien Howard Shore de livrer ce qui restera sans aucun doute comme son œuvre phare, éclipsant toutes ses autres compositions. A l’annonce de son nom, les réactions de la communauté béophile furent cependant pour le moins mitigées. Et pourtant, avec la trilogie de Peter Jackson, Shore a totalement accompli sa tâche, au-delà des plus grands espoirs. Comme les trois tomes de The Lord Of The Rings, conçus par Tolkien comme un tout, les trois scores ont été pensés comme un seul, Shore ayant posé les bases de The Two Towers (Les Deux Tours) et de The Return Of The King (Le Retour du Roi) en amont dans The Fellowship Of The Ring (La Communauté de l’Anneau). Doug Adams, musicologue américain auteur de The Music Of The Lord Of The Rings Films, a pu plonger au cœur de l’odyssée musicale de Shore, étant invité dès 2001 par le compositeur à le suivre en Terre du Milieu. Premier cas d’un tel ouvrage se penchant sur les musiques d’un film, son livre nous entraîne dans les profondeurs du score, décryptant les très nombreux thèmes et motifs, traitant de leur utilisation dans les trois films, reproduisant les textes des chœurs et ceux des chansons, sans omettre de se pencher sur les sessions d’enregistrement, les instruments folkloriques ajoutés à l’orchestre… Fort d’un texte accessible, riche et précis, servi par une présentation luxueuse, The Music Of The Lord Of The Rings Films vient démontrer, au delà de la beauté intrinsèque de la musique, à quel point l’œuvre de Shore est remarquable de profondeur et d’intelligence, comme faisant écho et honneur à l’œuvre de Tolkien. Si l’ouvrage n’avait qu’un mérite, ce serait celui-là. Do you have a little leftover Halloween spirit? If so, I highly recommend you click over the CBC's radio-on-demand feed of John Klepko's "Unsettling Scores." This newly produced audio broadcast features a creepy assortment of compositions from horror and thriller films, and, of course, narration and insights by Howard Shore. In honor of our first post-book release Ongoing Discussion post, allow me to proudly present the Magpie-initiated Show Us Your Book photo album! Be sure to activate the captions on these via the word balloon in the lower left corner on the slideshow. If you'd like to add your own shot, please do! Magpie can be contacted here. In the meantime, let the conversation roll on! Aint It Cool News has just announced the winner of their Music of the Lord of the Rings Films giveaway contest. Click here to see who gets a complimentary copy of the book! This person isn't exactly a regular on our blog's discussion boards, but he/she does pop up from time to time. My heartfelt congratulations to an always-kind soul and a most deserved winner! Now stop dallying and click here to see who won! I was excited to see that a new review of The Music of the Lord of the Rings Films has appeared on a Polish Tolkien site, Bractwo Rivendell. Below is the original Polish text. I've also posted Google's automated English translation in the first comment slot. It reads a bit odd in spots, but it's a far better translation that I'd have been able to create on my own. If there are any of you fluent in Polish, feel free to make corrections. Nic nie mogło mnie już zaskoczyć. Na rynku pojawiał się film w wielu różnych wydaniach, muzyka, figurki, magazyny, naklejki, pocztówki, plakaty, a nawet filmy o filmie, muzyce, figurkach itd. Nie spotkałem się jednak z informacją, że pewien człowiek pracuje przy opracowaniu na temat samej twórczości Shore’a w tym filmie. Tak właśnie było w przypadku Douga Adamsa. W 2001 roku ten muzykolog i reportażysta został zaproszony przez Howarda Shore’a do obserwowania i dokumentowania jego pracy nad muzyką do filmu. W tym czasie uczestniczył w nagraniach, dyskusjach na temat wyboru muzyki do scen. Co więcejzapoznawał się z wszystkimi materiałami, także tymi, które do dzisiaj są dla nas nieosiągalne. Wiele z nich została bowiem niewykorzystana w filmie. Pojawiają się tam także pieśni, nowe motywy muzyczne. Adams mając dostęp do archiwum spędził w nim setki godzin przesłuchując unikatowe materiały. Uczestniczył też w koncertach i innych wydarzeniach promujących muzykę z filmu. Równocześnie swoje wrażenia i nowości na temat prac muzycznych zamieszczał na specjalnie do tego celu założonym blogu musicoflotr.com. Na tej podstawie udało mu się zebrać olbrzymie ilości materiałów, które przekształcił w niezwykłe dzieło – książkę traktującą o muzyce do Władcy Pierścieni. The Music… to 416-stronicowe dzieło pełne ilustracji Johna Howe’a i Alana Lee, przeplatanych z obrazami z filmu. Oczywiście najważniejszym elementem książki są informacje dotyczące procesu tworzenia samej muzyki, przebiegu prac i ciekawostek na temat motywów. Całość poprzedzona jest przedsłowiem Howarda Shore’a oraz wprowadzeniem Frana Walsha, autora scenariusza do filmu. Prawdziwą wisienką, na tym niezwykłym torcie jest płyta CD dołączona do książki. Zawiera ona 21 utworów muzycznych nie zamieszczonych na żadnym z dotychczasowych wydań płytowych. Ponadto na płycie posłuchać możemy dwuczęściowego wywiadu Douga Adamsa z Howardem Shorem. Poniżej prezentujemy listę utworów muzycznych zamieszczonych na kompakcie. Próbowałem znaleźć książkę na krajowym rynku, jednak w większych księgarniach pozycja, jak dotąd, się nie pojawiła. Możliwe, że nie pokaże się wcale ze względu na to, że jest pozycją obcojęzyczną, a nie było żadnych sygnałów, aby miała zostać przetłumaczona. Można ją jednak zamówić w brytyjskim internetowym sklepie Amazon za £33.83 (około 155 zł). Nowa pozycja na naszym rynku wciąż pojawiają się kolejne prace związane z filmem, ale nie każda jest tak ciekawa, jak The Music… dlatego warto śledzić dalsze działania osób związanych z działalnością wokół Władcy Pierścieni. A nie jest to koniec prac autora nad muzyką do filmów opartych na dziełach J.R.R. Tolkiena. Doug Adams już zapowiedział, że będzie brał udział w pracach przy Hobbicie, do którego muzykę skomponuje także Howard Shore. Będziemy śledzili na bieżąco jego pracę i informowali o ważniejszych wydarzeniach. Can I also remind people we have a "Show Us Your Book" album? If you want to have your book included in this album, send me your pic with the caption you wished to have attached to it. Without a caption, it will look like an anonymous image. I'll begin running this album in a few days, probably as a part of the November discussion board. As always, thanks to Magpie for her thoughtfulness and initiative!